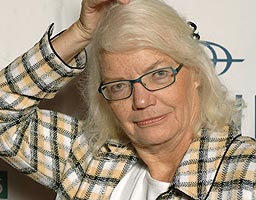 Quick: What do Bruce Lee, Brandon Lee, River Phoenix, James Dean and Molly Ivins have in common? The answer: Each died while poised on the brink of movie superstardom. Seriously. In recent years, Ivins -- the unapologetically progressive and exuberantly feisty author and columnist -- had become the go-to gal for documentarians seeking pithy and prickly commentary on Texas politics and politicians. Indeed, she provided some of the brightest, sharpest and wittiest insights in movies as diverse as Bush's Brain, Last Man Standing and The Big Buy: Tom DeLay's Stolen Congress. Her death at the ridiculously young age of 62 is a tragedy. While she was here, though, she made her indelible and inestimable mark. To pay her the greatest tribute I can think of: She left this world a better place than it would have been without her in it.